“Flying Coaches” was originally published in Vol. 9 of “Household Words” on August 12th, 1854, a magazine edited by the famous Charles Dickens. It has been identified in “Household Words: A Weekly Journal 1850-59 Conducted by Charles Dickens” (University of Toronto Press, 1973) by Anne Lohrli, as having been written by Hannah Lawrence (1795 -1875). Lawrence seems to have been a prolific journalist, for a variety of periodicals, and to have specialised in historical topics, such as “Historical Memoirs of the Queens of England “, “ London in the Olden Time”, and “History of Woman in England ”. “Flying Coaches” comprises of a description of the first fast coach service from Oxford to London in 1669, which covered 55 miles in one day, halving the previous journey time. This comes from the diary of Antony Wood. There is then a critical review of an early (1672) pamphlet by John Cresset, who spoke out against the new fast coaches, pointing out the social damage they were doing to the country. Henry Newcome’s diary is also used to illustrate what could become of horseback travellers in the country. Lastly, a journey from London to Broughton in North Bucks in about 1735 is recounted. 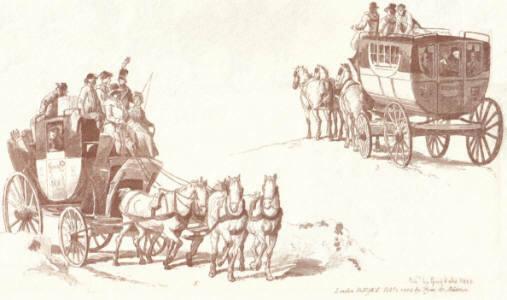 The passengers are forced to stop when the coach becomes stuck in the mud at Woburn Sands, and the conversation turns to highwaymen and the locals of the nearby “Hogsty Houses”, and eventually two of the coach occupants find they are closer to one another than they knew … Cruickshank’s cartoon of 1796 seems to be made for this very story. As to where Hannah obtained this last story, we do not know. Was she told about it, or found it in some long lost diary? Or was it her own invention, drawing from her own knowledge of the coach roads and the locality? Perhaps we will never know! Monday the third of May, sixteen hundred and sixty-nine, was a stirring morning is Oxford . As the early light dawned, gown and town were pressing with eager steps and eager looks into High-street; even the college authorities were awakened from their morning slumbers. What was the cause? Oxford , within the memory of middle-aged men, had witnessed more than one stirring scene. Along this same High street, in sixteen hundred and forty-two, Charles the First rode from the fight at Edgehill with his two young sons, and his nephews, Maurice and fiery Rupert, and banners that had been borne away, – but not in triumph, – and his red coats following. All the bells rung out their loudest peals, and hooded dignitaries knelt humbly before his Majesty, offering not only their lives and fortunes, as the modem phrase goes, but their cherished store of college plate – soon afterwards unceremoniously taken, and melted down, with scarcely a word of thanks from the Lord’s anointed. Then that fatal Midsummer day, sixteen hundred and forty-six, when the garrison of Oxford marched out, and, welcomed by no glad cheers nor sweet chimes, the gallant Parliament troopers, heralded by the peremptory blasts of the trumpet, as they passed along on their noble grey chargers, – “hell broke loose,” as Antony à Wood amiably remarks, – pioneers of freedom, as our readers will rather call them. 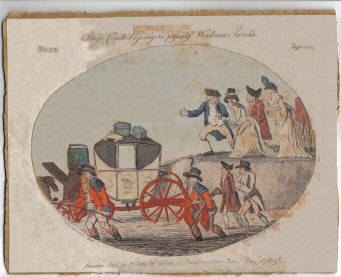 But it was neither the triumph nor downfall of Church and King, that now summoned the early multitude into High street: it was carefully noted down in Antony ‘s diary, as the most important event of the half year, “the first day that the flying coach went from Oxford to London in one day!” Stage coaches, – lumbering, wearying, waggon-like vehicles – had long been in vogue; and in one of these Antony à Wood himself had paid his first visit to London two years before, jogging along the road at the rate of two or three miles an hour; the wearied travellers lodging at night at Beaconsfield, and performing the journey in two days. It was no wonder that all Oxford was in a fever of excitement; a journey of two days, crowded, and cantered, and galloped into one day! Fifty-five miles between sunrise and sunset! What incredible swiftness! Would that a picture of this wondrous machine had been preserved; although from representations of later specimens, we can make a picture of it for ourselves, as it stood at the door of the tavern over against All Souls College , on that eventful morning. A huge wooden box, covered with leather, not much unlike the Lord Mayor’s state coach, minus the painting, the gilding, and the carvings; with a great length of axletree, the wheels seeming to run away from the coach, and the coach box a veritable box, filled with ropes, and spare traces, and hammer, and screw drivers, and nails – contingencies of a journey, to London with several breaks-down inevitable. It was intended to carry six, the usual number; and, as worthy Antony informs us, it had a boot on each side; an ugly projection, not unlike a small sentry box at each door, in which additional passengers were sometimes stowed. but intended, in this flying coach probably, for luggage. Master Antony à Wood, bound to London to consult the Cotton manuscripts, Mr. Halloway, a counsellor of Oxford (afterwards a judge), and four university men, took their seats; and then, according to the vice chancellor’s especial order, precisely as St. Mary’s chimes tolled six, off went the flying coach into High Street, with its precious freight, followed doubtless, by the anxious fears of a wondering crowd as to whether it would make its appearance in London by the appointed time – seven in the evening – without some dreadful accident. Whether Oxford, although never remarkable for go-a-head ways, took the initiative in this flying coach movement, we know not; but, from the Oxford historian, we have the first account of this neck-or-nothing travelling. We find from him too, that the experiment answered well, while from other sources we learn that nearly every town within fifty or sixty miles of the metropolis soon boasted a similar conveyance. Even Chester and Exeter were brought within three days’ journey of London . Such innovations could not be passed quietly over, by those who had vested interest in pack horses and pillions, in waggons, and in all the other good old ways of travelling. Justices at quarter sessions denounced these flying coaches as the ruin of the country, offering temptations to country squires and squiresses to spend their money in London. Horse-furniture makers, and carriers who, like Hobson, kept so many nags for riders, but did not possess a horse of their own, joined in the outcry. But, the public paid little heed, and went on establishing and patronising flying coaches in all directions. Rapid journeys to Reading could be had for seven shillings; to Oxford for ten shillings; to Northampton for sixteen shillings. The fares of coaches that performed their journeys in two days were from London to Bath twenty shillings; to Bristol and to Salisbury twenty-five shillings. There were, however, other expenses, in the form of fees to coachmen, which the indignant writer, from whose little pamphlet we have obtained the foregoing list of prices, carefully sets forth; it being his especial endeavour to prove that Flying Coaches are a pestilent invention, injurious alike to horses and men, to his Majesty’s excise, to his liege subjects’ health and comfort, indeed to the best interests of the realm by land and by water. 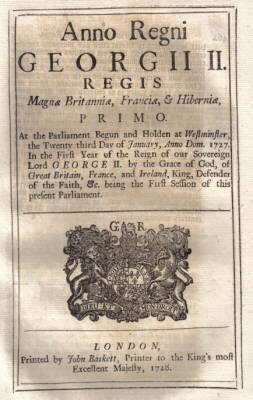 This little pamphlet, by one John Cresset, is probably unique. The title is “Reasons for Suppressing such Stage Coaches and Caravans as are unnecessary;” and the date is sixteen hundred and seventy-two. The reader will perceive that the very title begs the question; but, logic has no share in John Cresset’s composition, which is a specimen of a kind of argumentation not unknown to country gentlemen, even in the present day. That these coaches, especially when set up within forty or fifty miles of London, are one of the greatest mischiefs that have of late years happened to the kingdom, is the introductory remark; and this is enforced by the poser, What encouragement is there for any man to breed horses, if that lazy habit of riding to save their fine clothes be indulged in: for there are not near a fourth part of tie saddle-horses that used to be kept? Then, “even the largest stage coaches, the York, Chester, and Exeter, each with forty horses a-piece, carry eighteen passengers a week to or from London, which comes to eighteen hundred and seventy-two persons in the year; now, would not these passengers require many more horses if they rode? But more, his Majesty’s excise suffers, for now four or five travel in a coach together, and twenty or more in a caravan, gentlemen and ladies, without servants, and consume little drink on the road; now, travelling on horseback is drouthy work; moreover, if gentlemen have their servants with them, they must drink the excised ale and beer, instead of the small drink brewed by their masters at home that pays no excise at all. 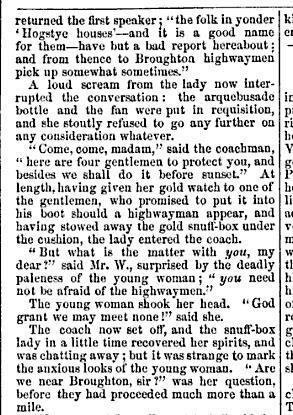 Then more clothing, capes, coats, safe-guards and boots are required for horseback, which makes it good for trade, whereas these mischievous coaches actually save people’s clothes.” Truly dreadful! What will the reader think of the following outfit for a traveller by stage-coach in the reign of Charles the Second? Now in coaches gentlemen wear a silk suit, an Indian gown with a sash, silk stockings, and beaver hats, and carry no other with them, because they escape the wet and dirt! Why gentlemen even used coaches to go to and from their country houses, and to pay visits: an unpardonable crime in the eyes of John Cresset. Then this pleasant means of escape from the wet and dirt causes country gentlemen to make journeys to London , and country ladies too, and then they must buy fine clothes there, and then they get into a perverse way of wanting everything from London , whatever it costs. Nor is the consumption of food at the inns so great, since these coaches were set up. “A coach with four horses carries six passengers; a caravan with four or five carries twenty or five-and twenty; but when they come to an inn, they club together for a dish or two of meat, and spend not above twelve pence or sixteen pence a-piece, though they sleep there. Take the grand roads of England, York, Exeter, Chester; there are about five hundred inns on each road, and these coaches do not call at fifteen or sixteen; so the landlords must be ruined.” This immense number of inns must have included every little wayside public-house, but strongly corroborates the remark of contemporary writers, as to the great consumption of beer and ale, as well as to the great traffic along the principal roads at this time. According to Cresset, there must have averaged nearly three inns to every mile. London herself is a loser by this tremendous innovation. It is not very clearly made out; but Mr. Cresset was credibly assured that some most worthy tradesmen have very much fallen in the world. It is not impossible, however, that the plague year, and the fire of London, the extravagance of the court, and the wretched misgovernment of the country, might have accounted for some trifling part of the commercial pressure of that day. Mr. Cresset’s illustration supplies a curious trait of the old London tradesman’s housekeeping. “There are several handicraft tradesmen therein who kept twenty or thirty journeymen at work, and spent a quarter of beef, and a carcass of mutton a week in their houses, who since these running stages and caravans have set up, have fallen to a couple of apprentices.” He tells us that lodgings in London let at five and six shillings a week, and that persons who took them during their stay in London had their meals fetched from the cook’s shop, at double the price of the inns. He also mentions that in the longer stages they changed coachmen four times, and few passengers give less than twelve pence to each coachman. The fares from London to Exeter, York, or Chester, were fifty shillings in the summer, and forty-five shillings in the winter (in the old lumbering coaches the price was forty shillings); there was also the passenger’s share for the coachman’s drink on the road, which he calculates at about one shilling and sixpence additional each journey. Now, when all these expenses are added together, judge, says he, whether men may not hire horses all along the road cheaper? The wretched equestrians were therefore compelled to seek the nearest wayside inn. where they met with wretched lodging, and still worse company. After getting to Cambridge, where they had little pleasure from the incessant rain, they set out on their return, intending for St. Neots that night; “but in our way also were strangely prevented. Mrs. Robinson was thrown off her horse at the bridge, and dragged by the feet in the stirrup. She got up, was dirtied badly, but yet unhurt: and after half-an-hour’s stay, we essayed to march again, and at the town’s end met our company coming on foot back again, which much amazed me. But we were forced to return back to our inn again, for my poor cousin Hannah was fallen into a pond, and so we got the same lodging, got her to bed, and were forced to stay at Cambridge this night also.” It is not difficult to imagine (John Cresset to the contrary, notwithstanding) with what delight Mrs. Robinson, wet and weary, and cousin Hannah, with her broken head and her cold bath in the pond, would have hailed the Flying Coach. We do not know whether any answer to this stinging little pamphlet ever appeared; but so earnest were John Cresset and his supporters to put down the enormity of flying coaches, that the following year the same pamphlet, scarcely altered in a word, was republished under the more attractive title of “The Grand Concern of England Explained.” The grand concern of travellers, however, was comfortable and comparatively swift travelling, and flying coaches multiplied, in spite of occasional accidents. During the winter the greater number seem to have been laid aside; this being rendered necessary, especially in the more distant parts of the country, by the unsafe state of the roads, and the danger of sudden floods. A sad instance of the latter is. recorded in the Domestic Intelligence, of sixteen hundred and seventy-nine. A coach between Boston and Lincoln, was carried away by the violence of the October floods, when all the six passengers, together with the horses, were drowned, and the coachman narrowly escaped. Ralph Thoresby, in his Diary, sixteen hundred and seventy-eight, mentions that all the stages in Yorkshire were also taken off the road at the approach of winter. When at Hull, suffering severely from ague, his father hired one for their sole use to bring them both to York; an arrangement that well suited the sickly youth, but which as little suited the stout Yorkshire clothier, his father, who could not endure the effeminacy of that way of travelling. In summer time, the chief danger was from highwaymen, who sometimes collected in considerable numbers. Thus, in the same Domestic Intelligence, we read that “several passengers, both men and women, to the number of fifteen, going in three or four coaches toward Bath and Bristol, were set upon by some highwaymen (supposed to be soldiers), well armed, about Stokechurch, in Oxfordshire [a very desolate part at this time] who robbed them all of very considerable value.” For such dangers, the state of the roads was chiefly answerable: or rather the country gentlemen, whose business it was to keep them in order; but who never did so until compelled by local Act of Parliament to have them mended now and then. Thirty years after Antony à Wood’s coach performed its eventful journey, the Vice-chancellor’s regulations were just the same, and the fare, as then, ten shillings. From the lively account the Spectator gives of his journey up to London, from Sir Roger de Coverly’s, with Mrs. Betty Arable the great fortune, and the officer, and the quaker, we find that he travelled at much the same speed as these stages did, So bitterly denounced by John Cresset forty years before. The boots of the Oxford flying coach would, however, have been of advantage here; for he tells us the captain’s half-pike was placed near the coachman, and the drum behind the coach; and then “our cloak bag” was fixed in the seat of the coach. Thus our great-grandfathers and their sons jolted along for more than a century, until Mr. Palmer startled the public, and aroused the indignation of every stage coachman on the road, by his daring project of conveying the mails by post coaches, that should perform their journey at the average rate of from eight to ten miles an hour – flying coaches indeed! Mail coaches and flying coaches are alike seen no longer, and their haps and mishaps are among the things passed away for ever. Sometimes amusing incidents occurred during these long journeys; and the very upsets, the stickings fast in the mud, and alarms of highwaymen, formed stories to amuse stay-at-home friends, or news-loving gentlemen at the evening clubs. Sometimes, these annoyances produced more important results, as about a hundred and twenty years ago, Mr. W. found. Mr. W., for it is only by his initial letter that he has been handed down to posterity, was a London merchant, well to do, in the well-to-do days of George the First: a merchant over whom the storms of life had passed lightly. He was the eldest son of a merchant, and as his only brother had evinced more inclination for roaming than for the quiet pursuits of the counting-house, his father bought him a commission in the army, and bequeathed the prosperous business to the elder son. These boys had been strongly attached in childhood, and until the father’s death; when a slight difference produced a bitter quarrel, and the brothers parted, determined to see each other no more. The younger went abroad with his regiment. It was said he went to America, and then, the elder altogether lost sight of him, while he, in the old house in Great St. Helens, passed thirty years of thrifty toil, not wholly unrelieved by holidays, but holidays which were only of a single day, and which extended no farther than Chelsea, and Hornsey, save on one memorable occasion, when he stretched as far as Epping, and actually spent three days beyond the hearing of Bow bells. At length a summons came for Mr. W. to undertake a veritable journey – a journey to Nottingham, where a cousin resided; and, as Mr. W. believed this cousin to be his nearest relation now, and was anxions to aid him in arranging his affairs, as he had a large family, the journey of one hundred and twenty-six miles was determined upon. Mr. W. and his friends were very careful as to the particular coach to which he should commit himself, and at length they fixed upon the Wonder: a new stage and six, being a stout machine for half-a-dozen insides, newly built, with a careful driver, and strong horses. Punctually at six o’clock one fine summer morning, Mr. W. got into his place, and jolted off from the Axe Inn, Aldermanbury. On went the travellers (four precious insides) pleasantly and safely, to the village of Market Street , but here the Wonder showed signs of failure. At Dunstable the blacksmith was summoned: but his opinion could not be obtained by the passengers, it being reserved exclusively for the coachman’s private ear. They entered the dreary, dingy, grey district, which marked that especial trial to the wheels and axle-trees of flying coaches, the Chalk Hills. But, if they, ascended one side of each eminence slowly they descended the other quickly enough, and Mr. W. eyed every hill that rose before them very gloomily. But, thanks to the shoeless children that ran along beside them, scotching the wheels with small stones, they got on very well going up hill; but, down hill, the coach whirled along faster and faster; and at last actually overturned. Fortunately it came down on a soft place – a bank of green turf. The passengers were soon extricated from their prison. Mr. W. found he had escaped unhurt, but two of the four insides were severely bruised. As to the Wonder, it lay with battered sides and broken axle-tree, and all chance of further conveyance by that machine was given up as impossible. What was to be done? “Wait for the next coach that came past,” said the coachman, “and, if there was room, go on in it” The two unhurt passengers resolved to avail themselves of the suggestion; and, before long a coach was seen descending the unlucky hill. It was hailed, there was room for two insides, Mr. W. and the other passenger took their places in the London Express, and away they went. The insides consisted of two countrymen, a lady very handsomely dressed, who displayed a gold snuff-box – most ladies took snuff then – and a young woman very plainly attired, but pleasing, and ladylike. The chalk hills were safely surmounted, and the travellers went on pleasantly enough to Woburn . But there was danger now of being stuck fast in the Woburn Sands – indeed, if the waters were all out, of being plunged into a mud bath. The Express toiled along, and the wheels were deeply and more deeply imbedded in wet gravel. The lady casts an anxious look towards the basket behind, and yet more anxiously observed the water leaking in at the ill-closed doors. They sank deeper and deeper into the mire, and only by the aid of a countryman’s team of horses was the Express pulled out upon terra firma. The passengers alighted, wet and angry, and bemired almost to the knees; but the young woman bore the annoyance quietly; and when Mr. W., who had been struck with her gentle manners, expressed a hope that her luggage had received no injury, she smiled mournfully: “It is of no great value,” she said. The traces which had been broken were quickly mended, and the coachman summoned the passengers to re-enter. “Yes, yes,” said one of the gentlemen, “we had need be quick, that we may pass the next five or six miles before the sun goes down.”“No danger of highwaymen here, I presume?” said Mr. W.
A loud scream from the lady now interrupted the conversation: the arquebusade bottle and the fan were put in requisition, and she stoutly refused to go any further on any consideration whatever. “Come, come, madam,” said the coachman, “here are four gentlemen to protect you, and besides we shall do it before sunset.” At length, having given her gold watch to one of the gentlemen, who promised to put it into his boot should a highwayman appear, and having stowed away the gold snuff-box under the cushion, the lady entered the coach. The young woman shook her head. “God grant we may meet none!” said she. The coach now set off, and the snuff-box lady in a little time recovered her spirits, and was chatting away; but it was strange to mark the anxious looks of the young woman. “Are we near Broughton, sir?” was her question, before they had proceeded much more than a mile. “It must be a valuable one indeed,” said the lady scornfully; and the poor young woman burst into tears. “Oh yes, sir; it was given him by his only brother more than thirty years ago.” She drew from her under pocket a small silver snuff-box, and put it into Mr. W.’s hand. The London Express rolled on to Broughton, and there the young woman alighted, and there Mr. W. alighted; and he was soon in the poor cottage to which his brother, now a disabled officer on half-pay, had retired, clasping that hand which for thirty years, had never been placed in his, and kissing his pretty niece, of whose very existence he had been unconscious. …and there ends the story. Sadly, Mr W’s name is never given in full, otherwise it may have been possible to research the existance of his retired Army officer brother in Broughton.